Matt Kenseth inevitably gets the blame for making the Winston Cup (now Sprint Cup) championship so boring with his solid consistency in 2003 that NASCAR’s overseers decided something new and revolutionary was necessary. Two races to go and Jimmie Johnson no longer seems invincible in NASCAR’s Chase. There’s an old saying that good things come to he who waits. Well, Roger Penske has waited and waited and waited for a NASCAR championship. Twenty-seven years The Captain has waited. But, thanks to Brad Keselowski, it appears the wait is over. 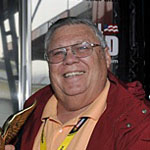 I wasn’t sure if one of my RacinToday.com colleagues would write a column about the late Jim Hunter, one of the most popular and important people in stock car racing. It’s Wild Card Week in NASCAR’s Chase for the Nextel Cup championship. Talladega Superspeedway is always the biggest question mark among the 10 races in the stock car postseason. Anything can – and usually does – happen on the high-banked 2.66-mile oval; NASCAR’s longest oval. The first time I met Tim Richmond was in 1980 when he showed up at the Indianapolis Motor Speedway as a rookie. It may sting for a while, but Darrell Waltrip and Cale Yarborough – and their fans – should not get too upset over their failing to make it into NASCAR’s Hall of Fame in the first two five-man classes. So far, this year’s Chase hasn’t drawn the TV audience or the paying fans that many in NASCAR figured it would, especially given the rules changes and other tweaks intended to make the racing on the track more exciting. Charlotte, N.C. – I voted for David Pearson, Bobby Allison, Lee Petty, Cale Yarborough and Darrell Waltrip. One of the great honors of my professional life is being part of the voting committee for the NASCAR Hall of Fame. But, in this case, along with honor comes great responsibility.